The ExoMars Program is a cooperative program between ESA and ROSCOSMOS with participation of NASA, aimed at investigating the Martian environment. The industrial consortium is led by ThalesAleniaSpace (TAS). The first satellite, successfully launched on 14th March 2016 and currently on its way to the Red Planet, consists of an Orbiter embarking a High Gain Antenna (ref ) and an Entry, Descent and Landing Module (EDM). The EDM is equipped with a Ka-band Radar Doppler Altimeter (RDA) instrument to monitor the correct attitude and cruise of the landing module. 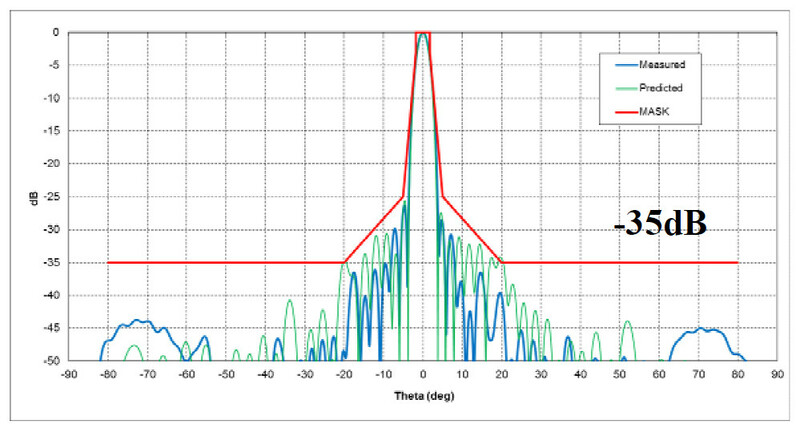 The RDA instrument embarks four identical antennas, developed by ThalesAleniaSpace-Italia (TAS-I), ref. , providing the radar with one Nadir-looking and three beams symmetrically squinted of 20° along azimuth. The range and velocity information along the beams are needed to control the module during the descent phase of the lander. RDA four antennas sub system assembly. Courtesy ThalesAleniaSpace-Italia. 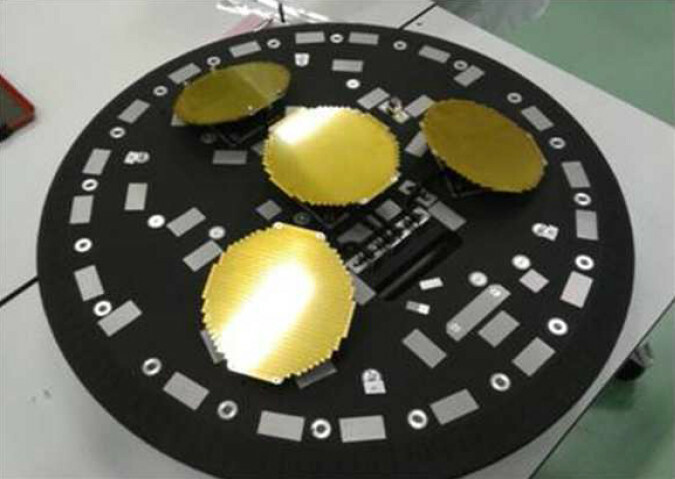 Exomars RDA Antenna. Courtesy ThalesAleniaSpace-Italia. Measured patterns in E-plane vs. CST simulation. Ref. . Courtesy ThalesAleniaSpace-Italia. Measured patterns in H-plane vs. CST simulation. Ref. . Courtesy ThalesAleniaSpace-Italia. 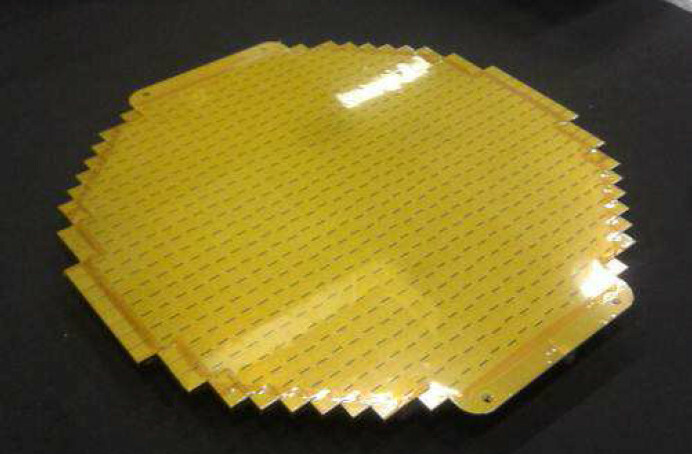 Exomars RDA Antenna is a resonant array of circular shape operating in linear polarization, made by 736 radiating slots of shunt type cut on 30 rectangular waveguides. The radiating aperture fits a circular envelope of 220mm of diameter and 15.3mm in height (ref ). Very demanding requirements are applied on sidelobe mask. As mentioned in , SWAN™ software played a crucial role in the design phase, since it would have been impossible to design such a complex antenna with any standard full-wave software today available. The array initial geometry was synthesized with the software SWAN™. The presence of a protective Kapton film installed on the antenna was taken into account by a rigorous wide band full-wave extraction of the slot model, including the dielectric layer. 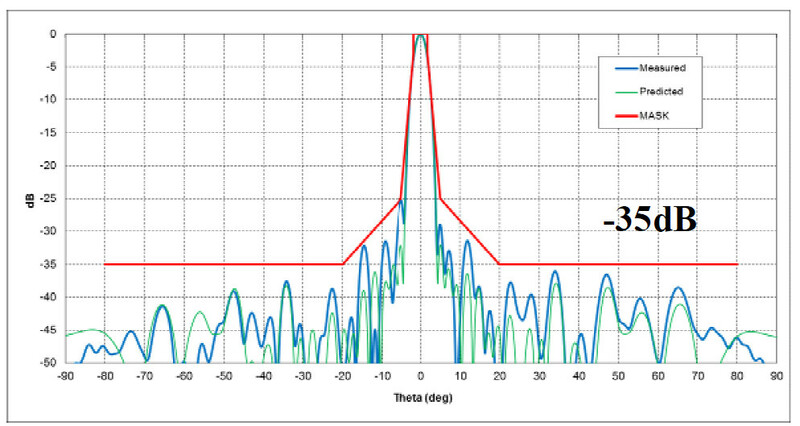 As detailed in , the array performance final optimization has been carried out through FDTD analyses done with CST mWave Studio®. The very tight gain mask is overlaid to the patterns, demonstrating the fulfilment of the low template of 35dBpk in the far out region. Remarkable is the absence of grating lobes in the H plane, denoting the design robustness vs biased manufacturing errors in slots positions. R. Mizzoni, P. Noschese, P. Campana, P. Cecchini, M. Lanuti, G. Mascolo, A. Meschini, F. Poscente, R. Trento, “Antenna Technologies for Science Missions in Thales Alenia Space Italia,” 8th European Conference on Antennas and Propagation (EuCAP), 6-11 April 2014, The Hague, The Netherlands. P. Cecchini, R. Mizzoni, O. Bayle, E. Saenz, A. Winton, “The EXOMARS Rarar Doppler Altimeter Ka-Band Slotted Waveguide Antenna,” 36th ESA Antenna Workshop on “Antennas and RF Systems for Space Science” 6-9 October, ESA/ESTEC, The Netherlands.